A number of subcontractors have complained that they have not been paid for their work on the State-funded projects. THE CONSTRUCTION OF 190 new social housing units, which have stalled due to MDY Construction entering examinership, will be completed, according to Minister of State for Housing and Local Government, John Paul Phelan. Last week, concerns about the financial situation of the company, which has a number of State contracts, were raised. The construction company, which has since been placed into examinership, was involved in building state-funded social and affordable housing projects in Wicklow, Kildare and Dublin. Sinn Féin’s Aengus Ó Snodaigh said Cherry Orchard residents are particularly disappointed, as it had been expected they could move into the houses very soon. Of the 72 units to be constructed on the Cherry Orchard site, 36 are completed and 36 are under construction and were due to be completed by November 2018. The minister said he could not give a commitment that the homes will be occupied this week, said he would try and establish from the local authority when people can expect to move in. “I understand the sense of hope for a family who have been on a housing list for a long time. They know the house they are supposed to get, but this suddenly happens and they do not know when they can move in. It is certainly not a position the government supports in any way. Those 36 houses should be occupied as soon as possible,” he said. While concerns over construction on the building sites stalling, worries have also been raised about a high number of subcontractors working on site who have complained that they have not been paid. Minister Phelan said the situation is ”unfortunate and regrettable for all concerned”. He explained that the contracting body in each case is either the local authority or the approved housing body responsible for the project delivery, and they are dealing directly with the issues arising from the main contractor discontinuing construction work on these sites. “Without question, these projects will be completed in full and as soon as possible. Despite the risk of delays arising, we have seen in situations where this has happened with social housing projects before that local authorities and housing associations have done all the due diligence needed and completed the projects. That is what will happen with these projects,” he said. The minister said it local authorities and approved housing bodies have secured the sites and legal and financial issues are being addressed. The Department of Housing is keeping in close contact with them in order to facilitate the earliest possible recommencement and completion of all the houses, he added. He said the sites will not become “ghost estates”. This is simply not the case. As I have said, we intend that these projects will be completed as soon as possible and that the social housing homes will be made available to the people who need them, fully complete and built to the usual high quality we have seen with the social housing developments being completed each month. The provision by the minister of the funding and support necessary to complete these projects will not be an issue. Local authorities and housing associations know that and they are taking the necessary steps to handle the challenge as a matter of urgency and to move the projects forward. Ó Snodaigh many subcontractors have taken all of their equipment and left the sites, due to not being paid. The government needs to end the continuous abuse of subcontractors, he said. Earlier this year, subcontractors working on State-funded school projects were left unpaid after Carillion, a major construction company, went bust. Education Minister Richard Bruton said the government had no role to play in ensuring subcontractors were paid. “Here again we have workers and subcontractors with no wages and no income, which will cause other financial difficulties, if not collapses of small companies. This needs to be borne in mind,” said Ó Snodaigh. One subcontractor told TheJournal.ie it is owed in excess of €300,000, and said other subcontractors are owed similar amounts. They said the government needs to step in, stating that subcontractors are going to lose out. This subcontractor said it has tried to contact Housing Minister Eoghan Murphy and Dublin City Council over their concerns, but has yet to hear back. “Did the government not check that they had sufficient funds behind them to follow through on these projects?” they asked. Another said they on one project they are owed over €150,000 and have only received €50,000 to date. They said no one wants to be accountable for the subcontractors, adding that they should be allowed remove their property from the homes if they do not receive payment. 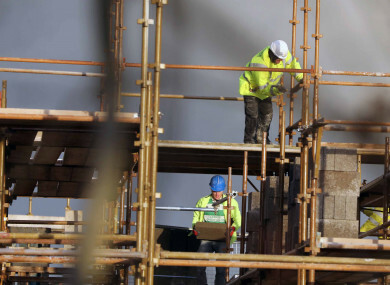 Another subcontractor removed its scaffolding from an MDY site for 32 houses at Dunmurray Rise, Bishopsland, County Kildare this week, amid fears that they will not be paid the €140,000 owed to them. Phelan said the point raised about subcontractors “is a valid one” adding that there have been other examples nationally in recent times where subcontractors have been “left high and dry following the collapse of larger construction businesses”. Email “Minister says 200 new social housing units stalled due to construction firm examinership will be delivered”. Feedback on “Minister says 200 new social housing units stalled due to construction firm examinership will be delivered”.